Spend a few hours exploring Jewish Berlin with a guide who is also a scholar of Jewish studies. Learn about the long history of the Jews in Berlin, particularly of the last century. Visit the foundation of the Old Synagogue and learn about the struggles of the Jews during the Middle Ages and Renaissance. 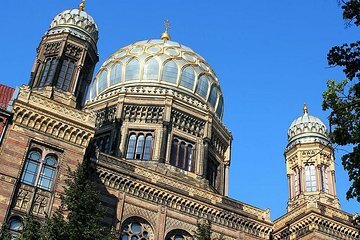 Then head to the great New Synagogue, built in 1866, before heading to the Jewish Cemetery and visiting a new kosher cafe to learn about contemporary Jewish life in Berlin. Heather, our tour guide, was the best person to take this tour with. Her passion of the topic really shines through into the tour, and I learned so much from it. She is very happy and open to discuss things with you, and is willing to answer any questions you have. Would highly recommend to those who are looking for an overview of all Jewish history in Berlin, as well as specific monuments, plaques, and museums. Fabulous tour. Isabel Daniel was an amazing guide. She answered every question we asked and was the nicest young lady you could possibly have as a tour guide. By the end of the tour we were inviting her to visit us in Los Angeles. She is completing her Ph.D in the topic we were exploring on this tour. We came away with a much better understanding of the history of Jewish life in Berlin from its beginnings in the 12th century. We highly recommend this tour. This small group turned out to be just myself and my husband.